Mattern Family: Radical Unschooling and Birdies! WoW as soon as we begin our unschooling journey an upheaval of negativity arises within our society! Im not going to go into all of the Good Morning America hoopla but will point you to some of the other unschooling mama's that have done a marvelous job of defending and expressing their own thoughts..
You can read Tara's post The Uproar Over Unschooling, Heather's post Unschooling Stephanopoulos: Good Morning America Fail, Child's Play Unschooling on GMA and lastly Lee Stranahan's Unschooling: How Good Morning America got it all wrong. We have actually been in the process of "deschooling" more than unschooling and yet the benefits to my family have been, ENORMOUS already! My children all of the sudden (now that I am not MAKING them learn things that "I" want them to learn) have started becoming more curious creatures asking all kinds of questions!! how can spiders jump and the list goes on and on and on! 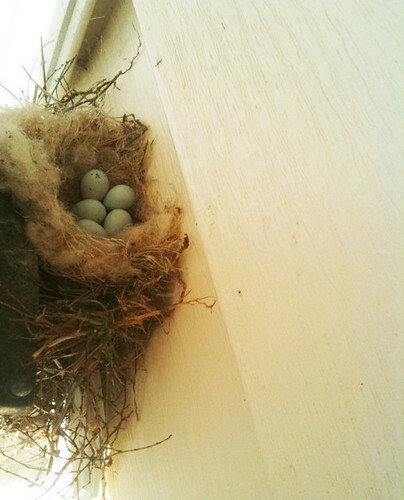 I want to share a neat little "gift" in our unschooling journey with you.. we have a nest at our house that we noticed about a month ago. This was our extent of learning/observing about this until a few days ago when walking through a bookstore my son asks me if we can find a book about "our" birds. WoW this totally surprised me so I go in search for field guides and we sit and read about the house finches (yes we have a male and female) that have made our house their home. I was THRILLED with this opportunity that I honestly don't think would have come had we still been homeschooling him! We have been spending time sitting outside near the nest and our lovely finches have become comfortable enough with us to fly up and sit on their nest.. (both male and female have been taking turns) and guess what... the eggs hatched yesterday afternoon!!! 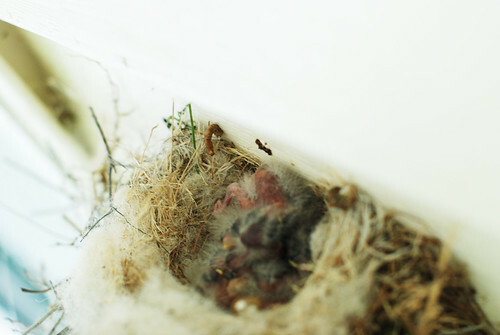 We have baby birdies!! I am loving the journey! I feel that through unschooling not only are my kiddos actually learning more but I have SEEN who my children really are as individuals and I feel that this week has brought us closer together as a family, not sure why but I am definitely enjoying that extra blessing! What an exciting journey you are embarking on! I can just feel the joy of you and your children as you discover the nest, eggs and now the baby birdies! Blessings to you as you continue to explore and learn. I am interested in this when all my children are out of diapers and sleeping through the night. I'll look forward to following your adventures! I watched the GMA segment and wondered if letting kids choose donuts for breakfast was really part of unschooling? This notion that the kids should decide everything for themselves, in every area of their lives, is that really part of it? Just curious. I thought it was more of an educational philosophy, rather than an all-encompassing parenting philosophy. I guess if that's what the radical part means, I would be a mainstream unschooler, because my kids would definitely choose donuts every time, if given the chance. lol I thought the segment was sickening, in that the journalism involved was so snarky and biased. I wanted to see what the kids could do, not listen to their answers to some rather dumb questions. I think that GMA chose only to show the "bad" instead of focussing on the reality of this families many experiences that they offered their kids! Yes some radical unschoolers let their kids choose on lots of fronts BUT you also have to remember that they can only pick the things that you have in the house.. its your choice what groceries you bring into the home and also what media... My kids choose what they eat for breakfast and even for lunch but its rarely EVER unhealthy because I buy "clean foods" My kids do have a bed time though :) They are allowed to stay up reading if they like but usually they are pretty tired by 7:00 and crash. I do give them two or three choices for breakfast and lunch, and as you said, they are all healthy choices. Choice is beneficial, beyond a doubt, when Mom and Dad have at least some control over the range. Some of us are night owls by nature, but most older kids and teens need 9 to 10 hours of sleep, so some sort of bedtime is healthy, even if they don't actually fall asleep until they've read themselves to sleep. Anyhow, I'm so glad you and the kids are excited! 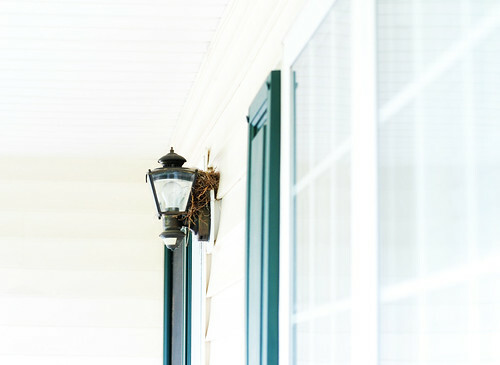 We love backyard bird nests as well! Such a fascinating process the birds go through. Great learning opportunity! I must apologize...I read one of the comments about Wasp as your own. Also, I failed to follow any of the links. I have since followed the links. One of the first things that came to mind was an ABC's Wife Swap episode a year or so ago. I remember a free spirited and unschooled family as a guest on the show. I have researched and found the family and how the schooling in her opinion was misrepresented as well. She has a web site to boot about unschooled education. 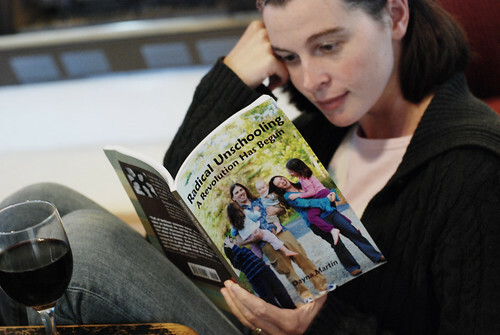 What happens after several years of unschooling? Do they ungraduate? This is so cool. I plan to unschool Luna, and she is already so curious and interested in everything that I can see her doing a wonderful job leading the way and letting me know what she's interested in. You sound like such a cool mama :).